Anne Bowes is a jewellery designer based in East Sussex and London. Her handmade unique and limited edition pieces have been sold in Selfridges and featured in national magazines. She’s also a working mum with three children, the fashion blogger Ella Catliff 21, a son 17 and daughter 15. 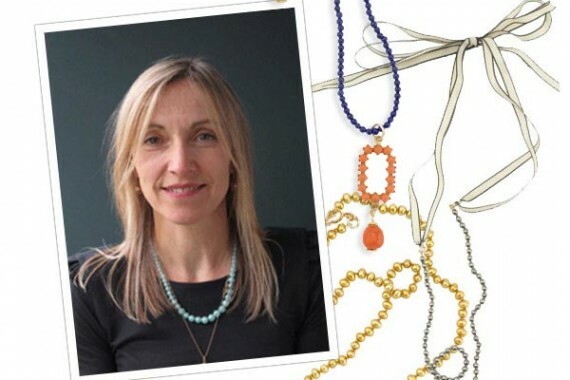 We asked Anne how she launched her inspiring career as a jewellery designer while being a mum. As a fine artist, I’ve always loved beautiful objects, and wanted to do something creative. Jewellery has always been a passion so about eight years ago I started making it on my kitchen table at home while my children were at school. I’m inspired by the beautiful and interesting objects that I find on my trawls around vintage fairs, Parisian markets, antique and curiosity shops and on the internet. I’m always on the hunt for quirky one-offs and pieces that I can break up and use differently to create jewellery around. When I first started out, Selfridges outsourced their non-designer jewellery buying. I found out their buyer’s name and cold called her. I managed to get an appointment and convinced her to take some of my pieces over Christmas – and they did really well. After a while I established my own style of design, which I call vintage contemporary. I mix interesting and unusual vintage finds with new pieces to create unique and limited edition jewellery. I use good quality materials such as precious and semi precious jewels and make up link chains and do hand knotting myself. If I need more complex or intricate work I get it cast for me. How have you managed to balance work with raising your children? As my children have grown older, I have had more time and energy to devote to my business – although they still do need me, and even now there are times when my responsibilities as a mother come before my career. For example, I planned to exhibit at the important Spirit of Summer Fair by House & Garden this May, but my son is taking his International Baccalaureate exams this summer, so I’ll have to wait until the Christmas Fair instead. Where do you sell your work now? I now sell my work predominantly through my website, annebowesjewellery.com and through small, selected shops. I also collaborate with clients to create custom designs. I would love to raise my profile further and produce more pieces. I also want to sell more of my jewellery in selected stores in London, as well as my website. But probably my key ambition right now is to collaborate with a label. Love jewellery? See more of Anne Bowe’s handmade jewellery pieces.